I was trawling through the internet as you do and copied this article (http://samilitaryhistory.org/3/d03mayne.html) about a striking and most unusual talk by Professor Philip Everitt entitled Bagged but Cheerful: A POW at Tobruk. Little did I know at the time that the British POW being given the military funeral was Hugh 'Pop' Benson. His talk, displayed with outstanding use of computer technology, was based on the experiences of his father, Sergeant Eric Everitt, who was captured at Tobruk on 21 June 1942. 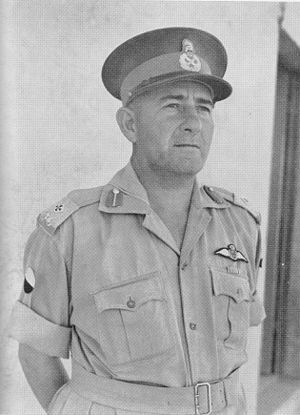 On that day, following blunders and confusion mostly not of his own making, the young South African Maj. General Klopper(pictured left) surrendered the fortress of Tobruk to General Erwin Rommel. Into "the bag" went some 33,000 allied troops, including 10,722 South Africans, including the whole of the 2nd SA Division, most of whom had hardly been in action. Incredulous, angry and somewhat ashamed they were handed over to the Italians for custody, and although a few escaped from captivity in North Africa, and a larger number on the capitulation of Italy, most were to see out the remainder of the war in the Stalags and Oflags of Germany. One of those was Sgt Eric Everitt who, after a stay in Italy, ended in Stalag IVB near Muhlberg in the very centre of Germany - which made escape extremely difficult. We were shown maps of all POW sites in Italy and Germany, a copy of Eric Everitt's prison ID card (which included a photograph and finger prints), a photo of the entrance of the camp, drawings made by the prisoners of the layout of the interior of the camp and most remarkable of all, photographs of the allied prisoners when in the camp. But the reality of discomfort was highlighted with the fact that 504 men shared a barrack hut. The question raised was "How did they Survive?" with the emphasis on "The Spirit of Man" in adversity, and the acceptance by all of the need for discipline and mutual respect between prisoners and between prisoners and their captors. 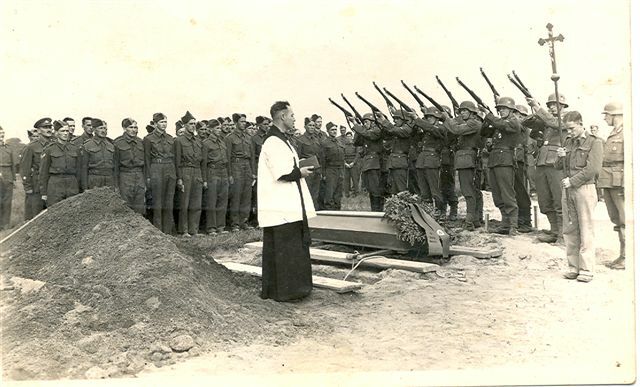 Photos were shown of allied troops marching past a saluting German camp commander and then of a funeral of a British prisoner with German soldiers in full uniform firing a 12-rifle salute over the grave. But the dominating theme of life in the camp, and its variety, was based on the reports printed in the Stalag IVB prisoner's newspaper The Observer. Many different copies of this remarkable newspaper were shown, highlighting the quality of its reproduction and the wide range of activities it covered from cartoons, sport (including soccer, Australian rules and on one rugby occasion the Springboks beat the Rest 9 û 0), theatrical productions, visits by the Swiss Red Cross, negotiations with the German commander, obituaries, medals awarded to prisoners after their capture, details of church services and most amazing of all detailed reports on the progress of the war. Surely the scoop of the life of the paper came with the publication of a photograph of Churchill, Roosevelt and Stalin in conference in Tehran which was belatedly shown in the 27th April 1944 edition. One wonders how the Germans allowed this to happen! Philip Everitt's talk, which brought time spent as a POW very much to life, ended as he ran through copies of the personal diaries of Sgt Eric Everitt as his time as a prisoner came to an end, the release by the Russian army and as his new life of freedom began prior to his return to Durban.